Itamar Medical Ltd., a company that develops, manufactures and markets non-invasive diagnostic medical devices for sleep apnea with a focus on the cardiology market, today announced the launch of WatchPAT 300, the next generation WatchPAT system for home sleep apnea testing. WatchPAT 300 includes several advances that are designed to enhance both patients’ WatchPAT experience as well as provide physicians with a trusted and cost-effective method for rapid, scalable and effective diagnosis of sleep apnea. 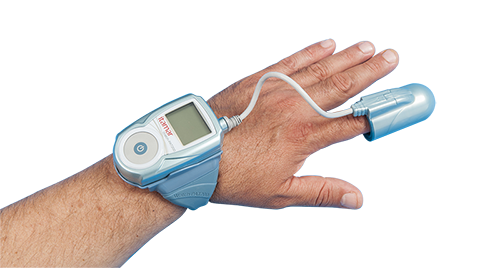 WatchPAT 300 utilizes peripheral arterial tone and other signals to calculate True Sleep Time and Complete Sleep Architecture to accurately and reliably diagnose both obstructive and central sleep apnea. WatchPAT 300 has an intuitive and more comfortable design with three points of contact and without cumbersome nasal canula or chest belts to ensure patient ease of use. It is based on the peripheral arterial tone signal (PAT) and uses its advanced actigraphy to differentiate between wake and sleep periods to calculate true sleep time. WatchPAT 300 also uses the PAT amplitude and pulse rate to differentiate between non-rapid eye movement (REM) and REM sleep. It also provides clinically validated sleep architecture, based on sleep stages, including sleep efficiency, sleep latency and REM latency. Its total sleep time reduces the risk of misdiagnosis and misclassification that has been reported to be 20 percent in studies using total recording time. WatchPAT 300 also includes a Central+ module, which enables specific identification for Central Sleep Apnea events. Its one-stop preparation comes with a significantly faster download and automated study preparation time to improve workflow. WatchPAT 300 was granted 510(k) clearance by the U.S. Food and Drug Administration on August 17, 2018 and will gradually replace the current WatchPAT 200 platform and will be presented at SLEEP 2019 on June 8-12 in San Antonio, TX (booth # 916). WatchPAT 300 will be compatible with zzzPATTM software and CloudPATTM, Itamar Medical’s cloud-based IT solution for convenient sleep diagnosis and secure patient data transfers to streamline workflow.